I have been addicted to self tanning lately, if you haven't noticed! I love all the new products out there specially formulated so that I can get a great tan indoors, without setting foot in a tanning bed. I don't want cancer but I DO so lust after perfectly bronzed, natural looking skin with NO wrinkles. Products like this one help me achieve that goal and I get to stay healthy at the same time. Best yet, I don't have to burn 4+ hours of my busy day laying outside in the sun, not accomplishing anything on my to-do list! I'm a busy girl! 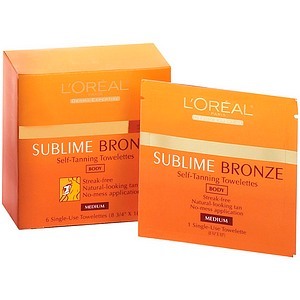 I didn't even know they made these, but I did a google search for self-tanning towelettes that you could find at the drugstore. I recently tried some towelettes from Birchbox, but they don't sell them in stores near me, and I didn't want to pay a hefty pricetag for something AND have to order online. I want my tan, but I'm a cheapskate. I picked these up at my local WalMart for $10 for a pack of 6. I found these to be superb quality. You can easily get through your whole body in one wipe, which is a problem I had with some other tanning wipes. I found that it showed up subtly on pale skin, which is awesome, because you can build it up over the span of 2-3 days, depending on how dark you want to be. The directions say to keep applying until you get to the desired color level and I found 2 nights in a row to be perfect to achieve my glow. 2 applications of this, 2 days in a row has been the answer to my tanning prayers and I couldn't ask for a better solution (or cheaper) to a quick, beautiful, natural tan. PS: We've been doing a lot of posts on sunless tanning products lately- if you're a new reader to our blog please do some browsing by typing "self tanning" in the search bar to check out some great posts!